"Gnome Improvement!" The heavy, almost cardboard, door hanger read in bright red letters on an emerald green background. "Bring good luck to your home and your family, brighten your lawn, and make your gnomes happy. 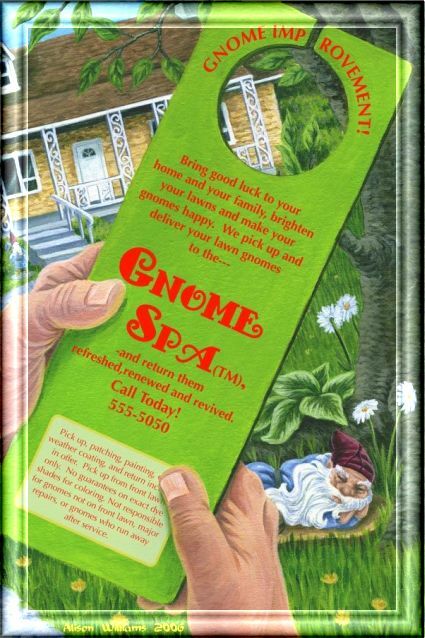 We pick up and deliver your lawn gnomes to the Gnome Spa (TM), and return them refreshed, renewed, and revived. Call today!" Marty stood in the summer-time shade of the overhang above the front step to his little slice of suburban heaven. Home, his castle, his retreat from his lousy job and idiot neighbors. He frowned at the door hanger, wondering if it was a joke of some kind. He held the paper close to his face to read the fine print at the bottom. "Pick up, patching, painting, clear weather coating, and return included in offer. Pick up from front lawn only. No guarantees on exact dye shades for coloring. Not responsible for gnomes not on front lawn, major repairs, or gnomes who run away after service." Lawn gnome maintenance. What would they think of next? Marty had to admit that his gnomes were sun-faded, and could probably use some paint and repair. 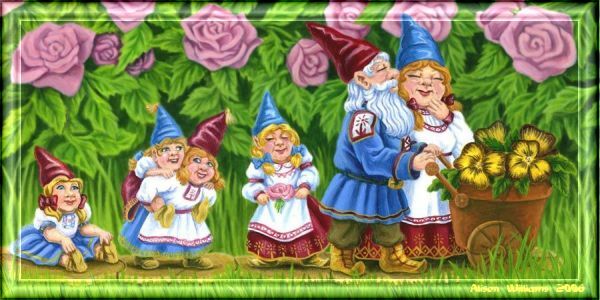 The young gnome couple pushing the flower-pot wagon were chipped, and the colors on the old gnome sleeping under the tree had faded to pale pastels. At least half of the gnomes had originally belonged to his parents; he remembered some from his childhood. Perhaps he should call. He'd talk with Lisa, his wife, about it first. The gnomes were gone for two weeks, leaving what appeared to Marty to be strange empty patches in the yard. He knew it was all in his head, but the yard just didn't look right without gnomes. The day the gnomes were dropped off, he and Lisa spent the evening arranging and re-arranging the gnomes. Marty held the old sleeping gnome, examining it in wonder. He could almost see the weave of the cobalt blue shirt and deep red trousers, the painting was so realistic. Veins and age spots had been painted onto the old gnome's hands. Marty watched the old gnome for a moment, sitting in the dark, pungent bark-mulch at the base of the maple tree. "Lisa, come here a minute." Marty moved to the other side of the tree, to examine the gnome from another angle. "This sounds stupid, but does it look like the old man is breathing to you?" Laughing, Lisa walked over from where she'd been setting the flower-pot wagon up, to hug him. "They did a fantastic job. I'd swear the couple look like blushing newlyweds that just realized everyone knows what they were doing last night. And Big Frank looks like he's been to the gym." Big Frank stood protectively, ax in hand, near the front door; as he had at Marty's parents' house through most of Marty's childhood. Marty's mother had always said with Big Frank outside she'd never fear the wolf at the door. Somehow the new paint job made Big Frank look like a gnome bodybuilder on steroids, just looking for an excuse to use the ax. Marty smiled up at Lisa. "Yes. Definitely money well spent. They look like brand new gnomes." Just then Mutt, the Jackson's dog from next door, squatted in their yard. Lisa and Marty ran at him, shooing him away. Laura Jackson hurried over to grab Mutt's collar. "Sorry about that." "It's all right," Lisa said. She whispered to Marty, "I think they trained him to come over here and do that." It was an old complaint, and Marty quickly distracted her with the display of the lawn gnomes. Three days later, as Marty stepped out of his car, returning home from work, he saw Laura Jackson leading Mutt out for a walk. She waved to him. "Hey, neighbor. How was work?" "Fine." Laura pulled on the leash. Mutt dragged behind her, obviously trying to go in the opposite direction. Laura frowned at him momentarily, before turning back to Marty. "I've been meaning to ask if you've been using some new fertilizer or weed killer or something on your lawn." Marty looked at his yard. He'd mown over the weekend, but a few dandelions had sprung up, testifying that he hadn't put any weed killer down. "No. Why?" "Mutt's been acting funny around your yard. He won't go near it, if he can avoid it." Laura stepped backward as Mutt lunged against the leash. "I just thought maybe he smelled something different." "No, we haven't used anything, as a matter of fact." Marty stepped over onto the Jackson's yard, and crouched down by Mutt. Mutt sniffed and licked Marty's hand. "Well, he still likes me." He shrugged, and stood up. "Maybe some big Doberman's been marking my yard." "Strange. Well, see you later." Laura waved as she walked off in the other direction. It was strange. Now that he thought on it, Marty realized there hadn't been any dog piles in the yard since the night they'd arranged the lawn gnomes. Big Frank had a strangely smug look on his face that Marty didn't remember being there. Marty glanced back at his neighbor's retreating back. Could it? Just in case, he leaned over, patted Big Frank's head, and whispered, "Good going." A week later, he found Lisa by the flower-pot wagon when he came home. She grinned at him. "Where did you get the little girl gnome. She is precious." "Little girl gnome?" Marty asked. Lisa waved a hand. Standing just behind the couple pushing the flower-pot wagon was a small, cute, gnome girl. She looked shyly at a tiny rose she held in her apron. She was no taller than knee high to her mother. Marty shook his head. "I didn't buy any new gnomes." "Then where did she come from?" They stared at the little girl for a while, before going back in the house. By fall a line of four little gnome girls stretched behind the couple pushing the wagon. The shy one with the rose in her apron was the biggest, almost half the size of her mother. Feeling rather stupid, Marty took the couple back behind the house for a quick lecture on birth control. The maple leaves turned red, and fell in a scarlet carpet around the tree. One night, as they were working in the yard, Lisa brushed the day's fallen leaves off the old man, and discovered the large crack, nearly splitting him in two. They carefully wrapped him up, and Marty took him to the Gnome Spa the next day. He had to drive out into the countryside. He knew he'd found the place even before he saw the mailbox with the address. Approximately two acres of rolling, tree-shaded lawn, enclosed in a white picket fence, contained hundreds of lawn gnomes. In the middle sat a small cottage, where a wizened old man stood on a porch, watching Marty approach with his blanket-wrapped bundle. Finding himself unaccountably tongue tied, Marty gently unwrapped the bundle, and held the old gnome out for the man to examine. As the man ran a finger lightly over the old gnome's features, Marty stammered, "C-can you fix him?" The old man shook his head. "Death comes to all things. I'm sorry." He leaned on his cane. "You'd best take him home, and dispose of him." Marty and Lisa buried the old gnome under the maple tree. It seemed to Marty that all the gnomes looked sad, even the blushing couple pushing the flower-pot wagon. As he raked the leaves the next weeks, Marty talked, very quietly, to the old gnome, telling him about work, and his dreams and hopes. He spoke to the other gnomes as he puttered around the lawn, but he mostly just said hello to them. He didn't talk to them like he did to what he thought of as the old gnome's grave. It seemed to soothe Marty. His job went smoother, and he found himself earning an extra bonus. He told the old gnome about it, and mentioned he'd hoped for a raise too. Marty had his raise by Thanksgiving, when Lisa surprised him with a gift. "But what's it for? What occasion?" Marty asked as he opened the wrapping. "Just because. Now open it." Inside was a lawn gnome. A winking man caught in the act of raising his hat, possibly to a passerby. He wore a vibrant blue jacket and deep red trousers, with shiny black boots. A Gnome Spa (TM) tag was looped around his ankle with gold metallic string. "I know he can't take the place of the old man," Lisa said. "But somehow he reminds me of him. And I thought he'd look cute out by the driveway." They took the winking gnome outside, to a crisp, sunshiny fall day. The other gnomes stood in their places. After a few tries, they decided he belonged several feet back from the sidewalk, near the maple tree. He made the place look more welcoming and friendly. "Welcome to the family," Marty whispered to him, and Lisa leaned down to kiss the top of his head. Lisa stumbled at the front steps. Marty caught her arm, and steadied her. "Just a little further. As soon as we get in you go to bed. I'll bring your medicine." Viral pneumonia the doctor had told them. Marty worried over Lisa as he helped her to their bedroom, and tucked her into the bed. In the kitchen he took the brown plastic medicine bottles out of the paper pharmacy sacks. He opened the cough syrup, and took a whiff. Not even the syrupy-sweet, artificially flavored cherry additives could overcome the nasty medicinal smell of the expectorant. Carefully laying out measured doses of the medicine, one cup with the syrup and another with the pills, Marty prepared a tray to take back to Lisa. A glass of orange juice, a glass of water, and a small candy dish of nibblers completed his work. After seeing that she'd taken her medicine, Marty left her to rest, and puttered around the house. At appropriate intervals he dished out more medicine, which Lisa frowned at before taking. Marty woke up in the middle of the night, struggling against a great weight on his chest. He felt too, too weak to push it off. Managing to get his eyes open, he discovered he'd fallen asleep on the living room couch. The overhead light blazed down, but while Marty had heard that light could push things he didn't think it could crush his chest, though there wasn't anything else that might be doing it. He fumbled his way to the kitchen, and found the thermometer. A quick check revealed he had a fever. "A lot of good you are," Marty scolded himself. "How're you going to take care of Lisa if you've come down with it too?" His last thought, as he sank to the floor, was that he probably ought to take some of her foul tasting medicine. Tiny hands opened one eye, and Marty had a quick glimpse of very short, bearded, black garbed man with an old fashioned reflector on a band around his head, just above a pair of old fashioned eyeglasses. Whoever it was made some noises, rather like, "hmmm," "ahhh," oh," as he poked and prodded Marty. Marty realized he should get up and check this out, but just couldn't work up the energy to do so. He opened his eyes, and watched the little man, who looked like the lawn gnome version of an old fashioned Victorian doctor, rummage around in a small, battered black bag. Marty closed his eyes and sighed. He must have been thinking about the lawn gnomes too much recently. A small hand opened Marty's mouth, and poured a truly fetid liquid onto his tongue. Marty gagged, choked, and swallowed. Tears watered his eyes, and dripped from the corners. 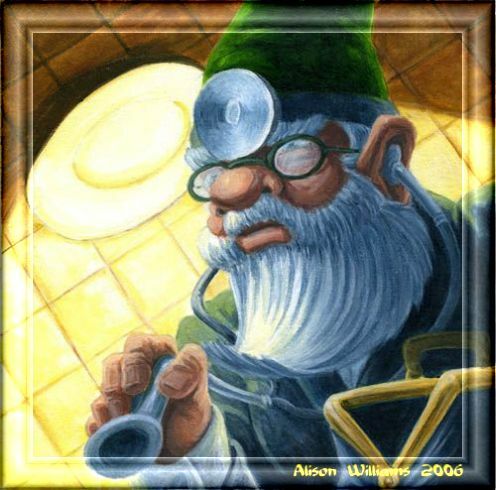 He sat up on the hard kitchen floor, leaning against the cabinet door, looking down on the lawn gnome doctor. The doctor merely smiled up at him, patted his leg, and walked away toward the bedroom. Marty wanted to get up and follow, but felt himself drifting off to sleep. "That had to be the strangest dream I ever had," Marty said, as he finished telling Lisa about his fevered hallucinations. "Funny, I was having similar dreams." Lisa kicked the covers off, and sat up on the side of the bed. "A cute little doctor in old fashioned black clothes with a little black bag coming in here, and taking care of me. You don't think...?" The bed rocked gently as she stood up, and made her way wobbling toward the window. She pulled back the thick blue drapes, letting the bright sunshine stream into the room. "Oh, my." Marty staggered over to stand by her at the window. There on the lawn, by the hedges under the window, was a tiny black carriage, with a little lawn gnome doctor sitting on the seat, wearing an old fashioned black suit, and beside the doctor was a small, battered black bag. Nearby, Big Frank guarded the front door. "If we don't get a bill from the Gnome Spa," Marty said, "We'd better make a large donation to their gnome reclamation fund." Rebecca Lickiss is the author of several books and stories.